With the fun and busyness of Christmas winding down, I decided to knit myself a pair of slippers. I had some inexpensive worsted weight wool yarn in reds and purples that I thought would be perfect for some Cosy Cosette Footsies, from Flawful Fibers. The pattern calls for sportweight, but with a few modifications I've knitted up a cosy little slipper for myself. I decided to do an applied I-cord edge. I really like how it tidies up the edges, but it did make the slipper a bit tight to put on. For the second slipper, I tried picking up a stitch twice in every other stitch and it works a bit better. I've ripped the I-cord off the first slipper and just have to reknit it. 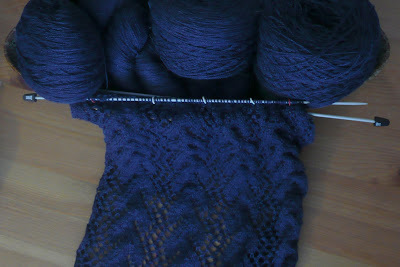 I've been doing a little other knitting - mostly on my Print O' the Wave shawl. 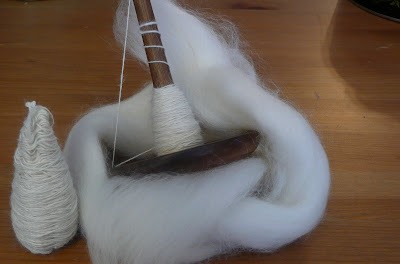 And some spinning - a super soft 1 oz alpaca sample - on my spindle. It felt wonderful not to be pushing for a deadline with my knitting, as I was for the last few months of 2009. All the gifted knitting seems to have been well worth it - each recipient loves their gift. Even though my brother thought the bunny for J was a kangaroo. In his defense, I guess the ears got squashed by Elie during shipping. And E won't play with Elie, apparently she feels that Elie is "too precious" and should sit on the shelf in her room. 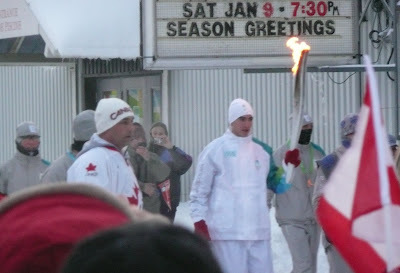 One highlight of the holidays: The Olympic Torch Run came through our town and a nearby city on January 1st! The kid's figure skating club put on a little exhibition as part of the celebration. Their coach did an amazing job putting together the 10 minute mini-show and the kids skated wonderfully. 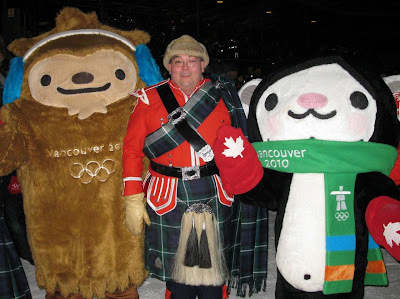 And G's bagpipe band played as part of the festivities in the nearby city. 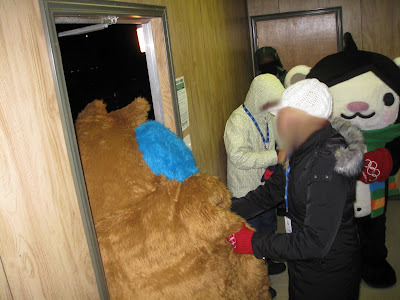 Apparently Quatchi and Miga had a difficult time getting in and out of the warm-up trailer. For some reason this struck me very funny! The kids went back to school yesterday and it already feels like we've zoomed back into our busy routines. very cute slipper! 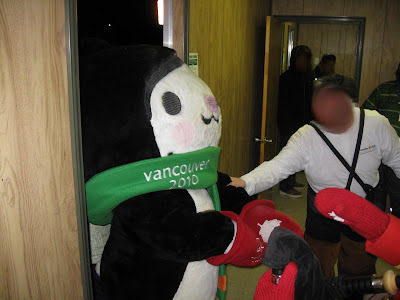 And I love those mascot photos of them stuck in the doors- I guess they didn't make the costumes with much thought to them being indoors!! The slipper looks adorable. I am a fan of all the colors in this post.